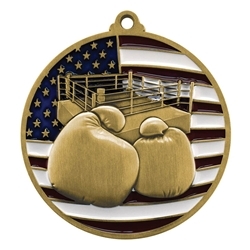 Boxing Patriotic Medals measure 2.75" in diameter and feature an American Flag background with red, white, and blue colored enamel. These boxing medals are perfect for any boxing recognition award. Made from a durable zinc alloy, this medal is available in your choice of antique gold, silver or bronze finishes. The back of the medal has a smooth, recessed area. This is where we add a 2" personalized emblem with your text. We can also add your artwork at no additional charge. Please email in along with your order number. Medals come attached to a 32" neck ribbon in your choice of color and width (some options only available in 7/8" width). Minimum of 12 pieces required.